Director, U.S. Integrated Ocean Observing System (IOOS), for her take on this initial survey and her perspective of its impact on the U.S. market. It is well-stated within, but in your own words and being observing systems as applied to end user bene? ts, nor does it as brief as possible, what was the original intent, and what investigate the full supply chain. While that information is is the point of producing “The Ocean Enterprise” study? very important, it was outside the scope of this study. 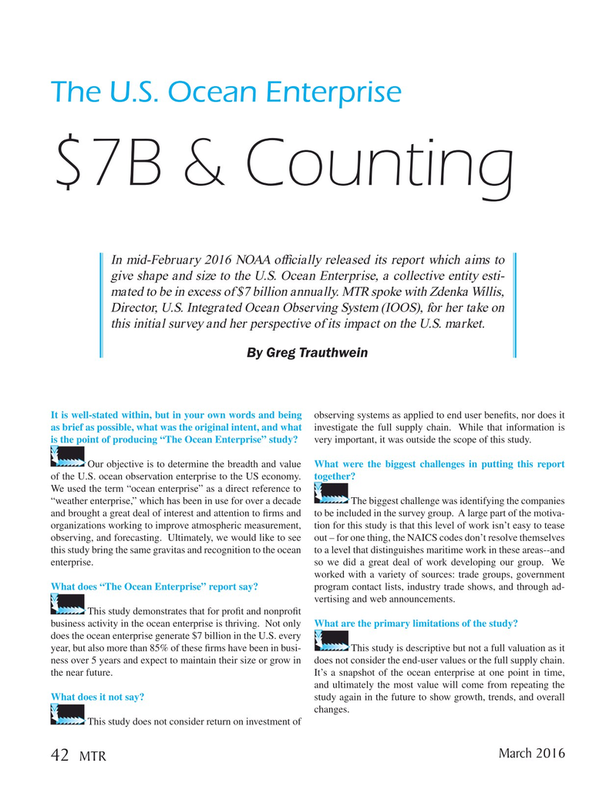 Our objective is to determine the breadth and value What were the biggest challenges in putting this report of the U.S. ocean observation enterprise to the US economy. together? What does “The Ocean Enterprise” report say? program contact lists, industry trade shows, and through ad- vertising and web announcements. This study demonstrates that for pro? t and nonpro? t business activity in the ocean enterprise is thriving. Not only What are the primary limitations of the study?